Creating a strong voice and visual style for your company is essential for success on social media. Skittles isn’t just a popular candy; it’s a business that has both nailed its branding on Facebook and secured a devout following of fans through its use of a unique company persona. Part of that branding includes serving as a fan page rather than a company page, an approach that can lead to skyrocketing numbers of followers. There are no calls to buy Skittles, and very few posts about contests or promotions for the candy. Skittles is treating Facebook as a place to further establish the brand’s attitude before a large audience with the help of good images and good writing. 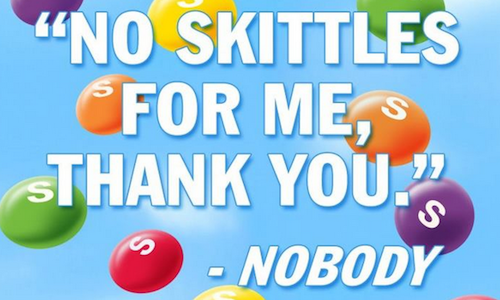 While Skittles is one of the best in the industry when it comes to social media presence on Facebook, it doesn’t have a monopoly on great social strategy. We’ve also taken looks at Red Bull’s Facebook Page and Spotify’s super-creative Facebook Timeline for inspiration, so check those out too if you want more insights. For the average person, social media is meant to be fun. 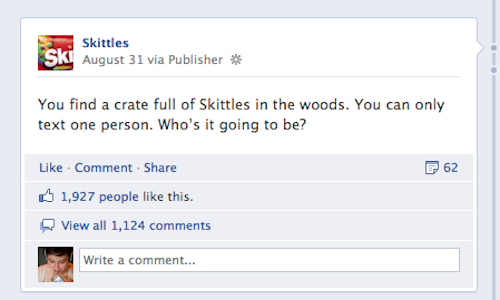 So even though Skittles is on Facebook for business, the tone of its entire Page is off-beat and quirky. Many of its status updates are simply oddball statements, often about the candy or about rainbows, but just as often are total non-sequiturs. A standard status post is,”Wouldn’t it be awesome if your yawns produced Skittles?” These goofy rhetorical questions are a great way to generate Likes, comments, and shares. 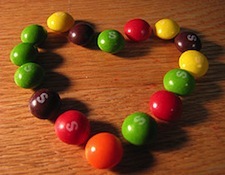 They are also a key part of Skittles’ work to brand itself as a hip and unique company. 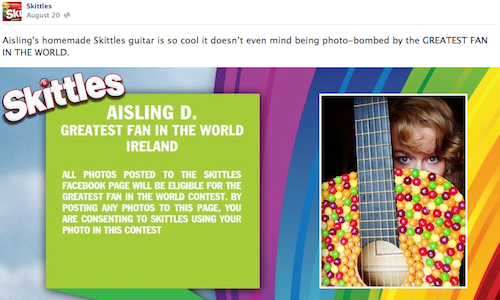 Another key element of Skittles’ success with its brand voice is that it frequently addresses fans directly. Most of the posts are written in first person, which humanizes the corporate Page and helps keep the company approachable. It encourages fan responses to the kooky posts. Skittles has a lower proportion of spam comments on its posts than many other company Pages, with the large majority of comments coming from fans genuinely expressing an interest in the product. The brand acknowledges this response with regular posts thanking fans, such as “Wow, 21 million fans! You guys wanna come over? I have a trampoline.” This easy charm and gratitude can help cement fan loyalty. Considering the brand’s catchphrase is “Taste the Rainbow,” it makes sense that Skittles has taken a vibrant, colorful approach to its photos and images. Most of its visual content has a cartoon style, as befits the goofiness of its attitude. It also has gone with consistency across these graphics, with most of them either showing the candy on a backdrop of blue sky or a neon-colored background with a simple image and silly text. These are similar to some of the brands’ other advertisements outside of Facebook, so the company is building on the recognition factor for its social media visuals. The brand also has gotten creative with photos of everyday objects covered with the candy. From a pair of roller skates to a hockey stick, the company has some wild ideas for turning its product into art. Skittles also then gives the candy-covered props to a celebrity for a photo shoot. Canadian hockey star Shane Doan posed with the hockey stick, while actress Alexa Vega supplied a video of herself scooting around on the Skittles skates. This is a great way for the brand to keep fans entertained and get them talking. Also, since most of the company’s own images are just graphics, it’s a way to vary the visual content on the Page. One way that Skittles keeps its followers excited about the brand is its Greatest Fan in the World series. Every week, the company showcases a fan photo in a fullscreen banner post. The image is always accompanied with a zany caption. This type of ongoing fan photo contest encourages followers to think about the product in new ways, and to come up with a unique way to show off their love of the candy. Even though the Greatest Fan in the World photos are presented as silly and fun, the company has taken steps to make sure they are explicit with the rules of using those fan photos. There is a disclaimer on each banner about photo eligibility, and the details are also written out on the brand’s About page. This is a smart way for Skittles to make sure that it protects itself against any legal or privacy complaints while still making it clear that participation in the Greatest Fan contest is encouraged. Do you know a company that’s a rock star on Facebook Timeline? Let us know in the comments!